Summer Programs for Kids and Events Coming Up! The Arsenal Center for the Arts offers a wide variety of week-long art workshops this summer, beginning June 17 – August 23. Choose from Comics/Cartoons, Creative Creatures, Puppets, Mixed-Media, Drawing, Basic Jewelry, Circus Art, Pottery and much, much more. Morning and afternoon workshops for three age groups: 5 & 6 year olds; 7 – 9 year olds; 10+. Supervised Lunch and Extended Day options available. Classes are held at the Arsenal Center for the Arts, 321 Arsenal St., Watertown, MA 02472. Free parking and easy access to public transportation. Registration and Information: 617-923-0100, ext. 309. Visit www.arsenalarts.org for workshop descriptions. Scholarships and Membership discounts are available. This is a one time sale that ends May 31st at Newton Sewing Studio in West Newton. Shop for books… without the guilt! 20% of your purchases will support our work bringing amazing authors into underserved schools in Boston. Belkin Family Lookout Farm will be open Saturday, Sunday and Monday for Memorial Day Weekend. The farm will open its gates for the entire family for the long weekend. Celebrate summer’s arrival and take a ride through the orchards, visit the Children’s Play Area, take a turn in the moon bounce, hang out with “Mike the Music Man” and find your way through the burlap maze. This option works for schools who had less snow days. This works for the Newton Schools since our last school day is Wednesday June 26th. The second session is the typical one: 4 days starting on Monday. 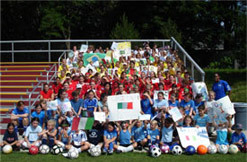 Soccer camps for girls at Boston College has two week options.